What happens to a world whose heroes disappear overnight? One year ago, every major superhero and supervillain disappeared in an event now called Ragnarok. Since then, thousands of normal humans have acquired means to empower themselves. Spell books float around on the Internet. Technology stolen from abandoned bases and secret headquarters has been reverse engineered for countless knock offs. In a city on the West Coast called New Arcadia, a group of ragtag civilians with new superpowers has arisen to take the place of the missing superheroes. The Heroes of New Arcadia began as a Wild Talents game as a sandbox campaign, where the actions of the players would make the most difference. Read the discussion on the RPPR Forums with the original introduction here. There are no cosmic superheroes or villains to keep the status quo in check. It is up to an unlikely group of heroes to save the city and later the world. As the campaign progressed, I developed a standalone RPG called Base Raiders from ideas created in this campaign. A Base Raiders continuation of the New Arcadia plotline will eventually be posted to the podcast. Until then, enjoy the saga of Chirop, Steel Centurion, Ghost Robot, The Martyr, Zero Shift, and Norm! Also check out the Base Raiders Kickstarter and website for more information about the game. Street Level Tier: A year after Ragnarok, a group of civilians found themselves with superpowers and a sense of duty. Together, they are the Heroes of New Arcadia. But before they can do much to protect the city from superpowered criminals, serial killers, and other threats, they have to start working together as a team. Episode 1: The campaign begins with a hostage situation in a federal courthouse. Can superpowered civilians succeed where the police cannot? 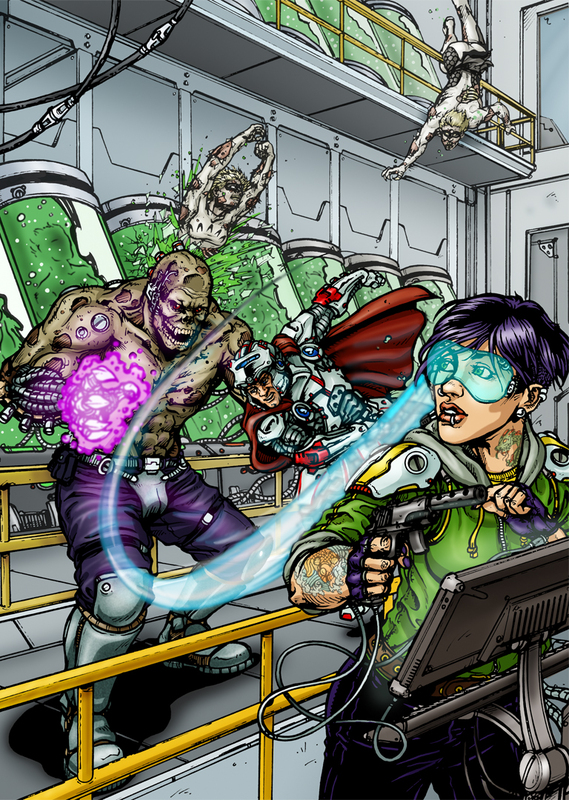 Episode 2: The Heroes track down a crooked doctor who transforming thugs into super soldiers. Episode 3: Some of the Heroes race against time to rescue a child from a death cult. Episode 4: Raid on an illegal weapons manufacturing facility controlled by the Syndicate. Episode 5: Cults and arcane mysteries abound! Episode 6: How do you stop a superhuman with a power that prevents you from fighting him at all? Episode 7: The Syndicate wants to destabilize the government and only the Heroes of New Arcadia can stop them. Episode 8: The Heroes decide to stop the Syndicate, no matter the cost. Episode 9: The final battle against the Syndicate! Not every hero will survive the battle. Episode 10 – Annual Game 1: Ross gets to play for once, as the Heroes investigate a secret prison built by a supposed hero. Global Tier: After the defeat of the Syndicate, the Heroes of New Arcadia are now recognized as a global superhero team and their problems just multiply. The truth behind Ragnarok is starting to leak out, but what consequences will it have for the world now? Episode 11: The Collective, a secret agency charged with controlling magical beings, has emerged as a threat to the Heroes of New Arcadia. Episode 12: The Heroes raid an abandoned superhero base to find crucial data and prevent villains from taking anything of value. Episode 13: Dinner parties with allies! Episode 14: Escapees from hell and a telepathic virus are causing trouble. Episode 15: The Heroes are attacked in their own home. Episode 16: Occult assassins and bone solvent. Episode 17: The Heroes retaliate against the organization that attacked them. Episode 18: An asteroid will wipe out all life on earth unless it is stopped. Episode 19: The superhuman convention is in town. Episode 21: The finale of the Global Tier. The Heroes make a final stand against the Remnant! Episode 22: Annual Game 2: This is totally not a meta-commentary on video games and fantasy cliches. Nope. Not at all. Cosmic Tier: Each Hero of New Arcadia is a powerful superpowered being able to individually change the course of history. As a group, they can do almost anything – but will they stand together for the final conflict? Episode 23: The Collective is more dangerous than ever, as a twisted cult of the Remnant. Other dangers, like a potential war between human-run governments and the superhuman community, are on the horizon. Episode 24: What would a Ross campaign be without at least one Carcosa-esque altered reality/hallucination scenario? Episode 25: The Heroes take action against the Collective and find out they’re prepared for war. Episode 26: The group battles the Collective’s secret weapon. Episode 27: Days of Future Past – New Arcadia Style. Episode 28: The Status Quo’s last gambit to retain power. Episode 29: A final battle and a new beginning. The past is prologue. All Hail the Heroes of New Arcadia!